Despite playing without Sudan Daniel and despite the bad shooting day of Garvo Lanete, the San Beda Red Lions was able to establish a big lead in the first quarter, 21 to 8 against the struggling University of Perpetual Help Altas (UPHSD). From then on, San Beda never looked back up to the last buzzer en route to winning their first game in the NCAA Season 87 Men's Basketball action. The final score of this game was 82-52. San Beda's height and heft on the court was their biggest advantage against the much shorter UPHSD Altas. Kyle Pascual and Jake Pascual bullied the shorter big men of the Altas. They were just too much for the 6'3 George Allen and the 6'2 Sumera of the Altas. The worsts part is that both of these two big men went down after injuring their ankles. San Beda continued to pile up their lead while those two were not on the floor. I also noticed that the Altas doesn't seem to have a system or set of plays on the court. You can really tell that they are not yet familiar with the system of their new coach because Boris Aldeguer resigned in the middle of the summer due to personal reasons. Those are just the adversities that the Altas had to face while they were playing against the Red Lions. The Red Lions showed tremendous respect against the Altas. They always contest their shots and they didn't slow down against them. In fact, the Red Lions had 19 fast break points in the first half alone. All in all I think they had at least 30 fast break points by the end of the game. Rome Dela Rosa stepped up in this game. When he saw that Garvo was off in this game, he demanded the ball from his sweet spots and he just splashed the ball countless of times. He was able to produce 15 huge points, 3 rebounds, 1 assist and 1 steal in this game. The Altas just can't stop the scoring blitzkrieg of San Beda. Take note, coming into the fourth quarter of this game, the Red Lions managed to build a 32 point lead, 77-45. They were just too much to handle. 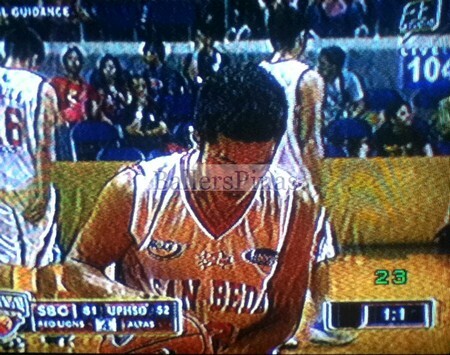 This win of San Beda was a testament on how good they are coming into this year's NCAA. I believe that they've found the answer on how they'll be able to work things out even without Sudan Daniel who was out for the rest of the season due to an ACL injury. The answers are just gang rebounding and total team effort. In this game, their big men doubled their work rate. They never think that they're gonna be too tired. They just continued to push till the very last buzzer. Kyle Pascual exhibited that fighter's mentality. He's ready to lead the front line of the Red Lions.